A snapshot is a point-in-time saved state of your VM. 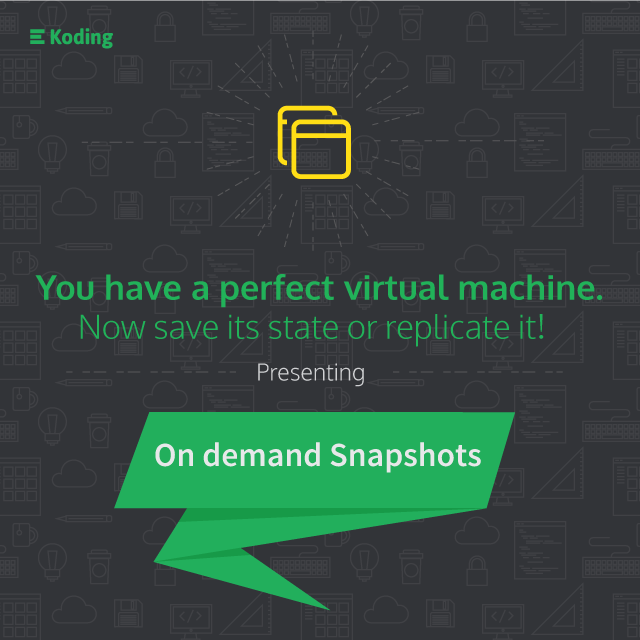 When you take a snapshot, Koding will place the contents of your entire VM into a saved state. This includes all the installed software, configuration files, preferences, etc. When you take a snapshot, you are essentially freezing your Koding VM in time. Making a backup of your VM: If you are about to embark on a major change to your VM, a timely snapshot can help you get back to a working state VM in case something goes wrong. This way, you can experiment as much as you need and be assured that you can always return to a state where you left things just the way you like them. The perfect starting point: A snapshot can be used as a starting point for a new VM. This means that you can set up a new VM as a clone of your existing VM thereby saving you hours in configuration time. This comes in very handy if you do a lot of client work or if you are a teacher and require a preserved state with your default software and preferences already in place. A detailed guide on how to use snapshots is available here.